Hello everyone! While I ardently wish that I would be in Milan right now to attend Fashion Week, I’m stuck in the drizzly Netherlands preparing myself for next week’s test week. Meh.. There comes a day when I also will be present at this event. Promise! As you can see, I was in a kind of grayish mood (which suits the weather here perfectly). 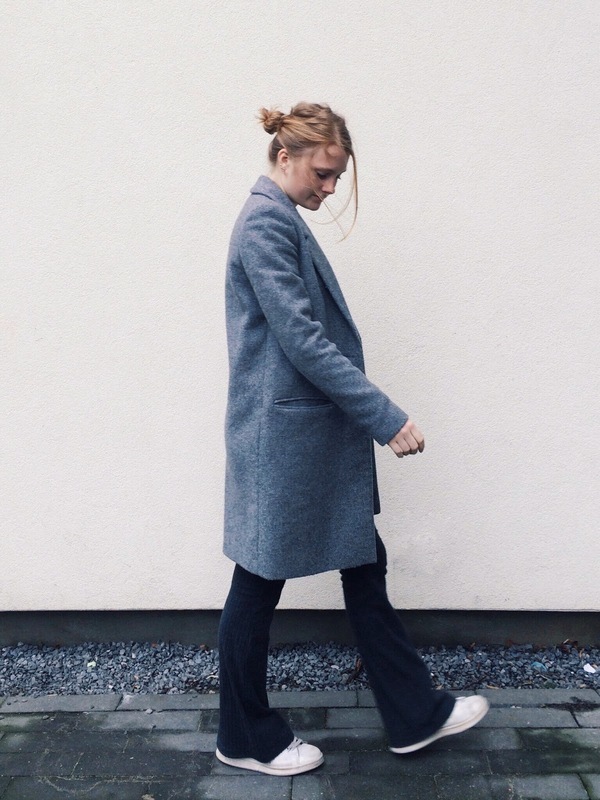 I paired a long grey wool-blend coat with a pair of flared leggings in a darker shade of grey. About these leggings. I’ve bought them actually a while ago, at the end of last summer, but I never really knew how to combine this item properly. Since I guess that they were actually made for jazz dance - the description on the web shop said ‘Jazz-pants’ … - I didn’t want to look like I was going to a dance class whenever I threw them on. So, since then, they were lying somewhere in a corner of my closet. But when I decided a few weeks ago to purchase a classic Come Des Garçons striped shirt, the problem was solved. It was, in my opinion, a perfect match. New year? New name! After blogging almost 2.5 years as The Yellow Coat at theyellowcoat.blogspot.com, I’ve decided that it’s time for something new. Why? Two reasons. 1. The name itself. In the past few months I’ve felt more and more that The Yellow Coat didn’t suit me anymore. That was the name I had come up with after I was totally in love with - can you guess it? - my new purchased yellow coat. Since I simply don’t wear it anymore and therefore it’s at this point somewhere far away in my closet, I just felt like it was time for a new name. 1. The length. Also, the length of my blog address bothered me. theyellowcoat.blogspot.com is just a bit too long. I wanted to move to a blog address that has ‘.com’ at the end instead of ‘.blogspot.com’. Since this blog is supposed to be a personal blog, with my view on fashion, lifestyle and all the other things that are keeping me busy, I felt like the name The Yellow Coat had a lack of personality. So I thought; what is a better solution then changing the name of this blog to my own name? So, from now on, the name of this blog will be Roos Koks and you can find it at rooskoks.com. This article was just to announce this change. I will be back soon with a usual article.